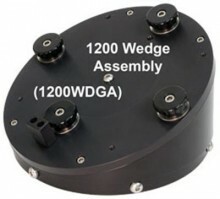 If your latitude is below 22 or above 69 degrees (21.5 and 68 degrees respectively for older mounts), either the 1200WDG or 1200WDGA wedge will allow you to place your 1200 mount in the proper position for polar alignment. Many of you will use the wedge in place of the Standard Pier Adapter (1200SPA) or Precision-Adjust Rotating Pier Adapter (1200RPA). The 1200 Wedge Assembly (1200WDGA) comes complete with the azimuth adjustor block, the center pivot screw and the four locking knobs with their hardened washers. Those of you who already have a Standard Pier Adapter, or who wish to use the wedge with the 1200 Rotating Pier Adapter (see below) can order the 1200 Wedge by itself (1200WDG). If using in place of your Standard Pier Adapter, simply transfer the azimuth adjustor block, the center pivot screw and the four locking knobs supplied with your original adapter to this wedge and bolt it onto your pier. Both of the wedge pier adapter configurations also include six 5/16-18 x 5/8 socket button head screws and six 5/16 x 9/16"OD x 0.060" flat washers, which enable you to attach the wedge to your Astro-Physics pier. Please note that this adapter must fit inside another part and be bolted from the side. It cannot be bolted directly onto a flat surface. If you wish to attach to a flat surface, use our 1200 Flat Surface Adapter (1200FSA). The 1200 Hi-Lo Latitude Wedge can be set up for either tropical (0-22 deg.) or polar (69-90 deg.) latitudes. Simply locate the Azimuth Adjuster Block either on the low side (tropical 0-22 deg.) or on the high side (polar 69-90 deg.) in the drilled and tapped holes provided. Tapped holes to reposition the north and south locking knobs for the high latitude configuration are also provided. The low latitude arrangement is shown in the images at left and is how the wedge is shipped. The 1200 Hi-Lo Latitude Wedge can also be used with the 1200 Precision Adjust Rotating Pier Adapter (1200RPA) to make polar alignment easier for mounts used in the field. The Wedge has been drilled and tapped to accept the 1200 Flat Surface Adapter (1200FSA). Attach the Flat Surface Adapter to the top of the Wedge with four 1/4 - 20 x 3/4" socket head cap screws (not included). If you have the 1200 Wedge Assembly, just remove the four Locking Knobs and the Azimuth Adjuster Block and leave the center pivot screw in place so it won't get lost! Then install the Precision Adjust Rotating Pier Adapter into the Flat Surface Adapter. Mounts: All 1200 mount models (DA, QMD, SMD and GTO) that have been produced. Note that the latitude range of earlier mounts is slightly different from the current 1200GTO mounts due to different polar fork styles. This wedge will work with ALL versions. Click the button below to add the Astro-Physics 1200WDGA Hi-Lo Latitude Wedge Assembly to your wish list.